The accessory designer uses Dropbox Business to streamline workflows, reduce file version issues and support its love of sleek functionality. In 2010, accessory designer Bellroy – named after their first two offices in Bells Beach and Fitzroy, Australia – set out to give customers a better way to carry everyday items. The company’s focus was on reinventing the leather wallet, but its affinity for sleek design and effortlessness impacted every area of its business. As the company expanded operations to include a partner agency in Portland, Oregon, a product development partner in Melbourne, and many suppliers overseas, their minimalist ideology was put to the test. With a patchwork of systems powering their file storage and sharing, certain workflows began feeling cumbersome and file versions became hard to track. To stay true to their core beliefs and support corporate agility, Bellroy decided to move to one solution for information sharing across global locations: Dropbox Business. Although Bellroy had used Dropbox with their assortment of other applications, moving to Dropbox Business allowed the company to centralise files and expand control. Co-founder and CEO Andy Fallshaw says “Our designers and distributors work around the clock, from many different countries, and it’s really important that they all work on the latest files. Dropbox for Business helps us ensure that everyone sees the right versions.” Being able to collaborate without issues allows Bellroy employees to keep projects moving, even when they’re on the move themselves. “Our permanent staff and freelancers travel between offices and countries quite a bit. It’s nice to know they can just pull up their files at any time with Dropbox Business” adds Fallshaw. Dropbox Business has helped Bellroy transform many of their old processes – including onboarding and file access management. Thanks to what Fallshaw calls the “easy icon at the top of the screen”, new employees can get up to speed on file sharing fast, with less training and fewer user errors. 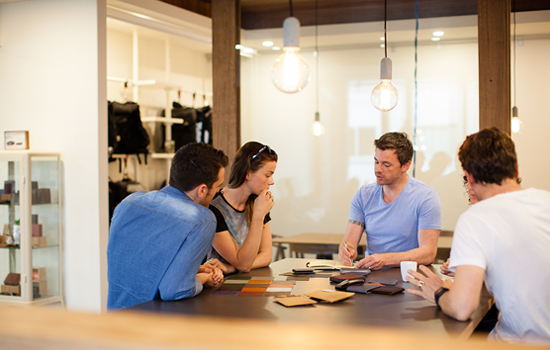 Once set up, they’re able to stay productive, while Bellroy stay in charge. According to Fallshaw, “It relieves a lot of the stress of bringing in someone new. I think with some other solutions, whoever starts a file or a version has ownership of it. With Dropbox Business, it’s clear that Bellroy are the owner, and will always control who gets access to the file and who doesn’t.” Ultimately, the efficiencies gained with Dropbox Business have given Bellroy more time to devote to wallets and other product design. As Fallshaw says, “Having Dropbox Business around means our team can concentrate on adding value for consumers instead of trying to figure out how to make software or files work”.